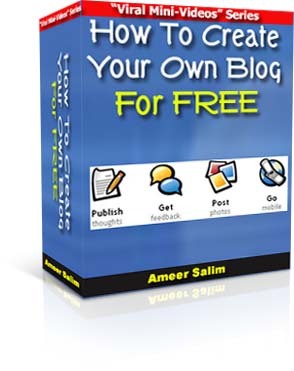 "How To Create Your Own Blog For FREE"
You are allowed to upload the videos to your own server to give streaming access to your members or subscribers. By default, when you purchase the videos, you will be given a an ebook in exe. format. In the ebook, there will be links to the download page of the videos. The videos can either be downloaded or watched via streaming on my dedicated server. Therefore, for those who are concern about web space and bandwith, distributing your own customized ebooks would be a better choice. Q1) Do we get free lifetime updates/upgrades? Q2) How can we distribute the videos? ii) You can upload the videos to your own server if you wish. Q3) What's the advantage of distributing only the ebooks? Ans: You will not need to worry about web space and bandwith. Everything will be hosted on my server. You'll only need to distribute the ebooks, which are very low in size. Q4) Is the product compatible with Macintosh computers? Ans: Unfortunately no. The ebook will be supplied in exe. format, which is only compatible with Windows. Also, the videos are created in Flash format (swf.) Most computers have this application installed by default. If not, users just need to install a small flash application on their computer (we will supply the download link) in order to view the videos.